Stand out to commercial property owners and managers with an emergency response plan. It is no secret that commercial properties are the holy grail for restoration contractors. This is true for many reasons — the jobs are larger, and it builds your reputation with other property owners and managers, to name a few. The trick that can be difficult for small- to mid-sized restoration firms is how to get into the door of not only the property manager and owner, but also the insurance agent who writes their insurance. You are not alone; you might be thinking: “Is there a magic trick that I don’t know about?” As with everything, it has a little bit due to do with luck and a lot of to do with intentionally positioning yourself to your prospect with a value that no one else has brought them. This value can be exhibited by a range of items. Unlike my usual articles, I’m not going to talk about insurance for cleaning and restoration contractors at all. I am going to walk you through how to fill your sales pipeline with commercial properties to intentionally position your company for first calls on commercial properties in your area. We are going to go past the brochures and the doughnuts and go straight into an innovative value that many of your competitors are not utilizing. So, what is the inside secret to filling your sales pipeline with commercial properties? Anyone biting their nails? 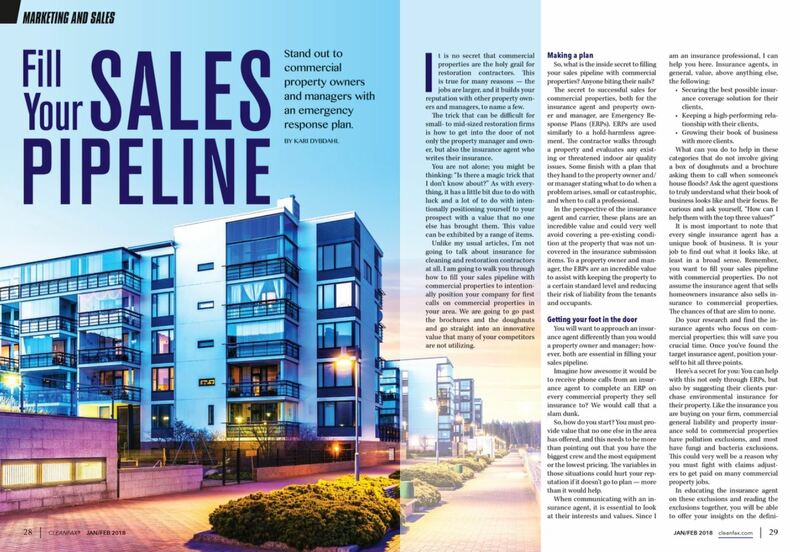 The secret to successful sales for commercial properties, both for the insurance agent and property owner and manager, are Emergency Response Plans (ERPs). ERPs are used similarly to a hold-harmless agreement. The contractor walks through a property and evaluates any existing or threatened indoor air quality issues. Some finish with a plan that they hand to the property owner and/or manager stating what to do when a problem arises, small or catastrophic, and when to call a professional. In the perspective of the insurance agent and carrier, these plans are an incredible value and could very well avoid covering a pre-existing condition at the property that was not uncovered in the insurance submission items. To a property owner and manager, the ERPs are an incredible value to assist with keeping the property to a certain standard level and reducing their risk of liability from the tenants and occupants. ← Mold Takes Over The #1 Spot In Pollution Claims!